and what the blue and red spots indicate are structures in the Universe when it was only 400,000 years old. Also remember that we describe these bumps and wiggles by the power spectrum which tells us how many blobs of particular sizes we should see in the image. Our theories tell us the power spectrum, but not the location of each individual blob in the image. As I mentioned last time, we describe the structure we see in terms of spherical harmonics, which are particularly useful functions to use on a sphere, and the power spectrum basically tells us how much of a particular function we need to add in to get the map above. I've been away for a few days at the Synthetic Universes for Future Survey at the University of Western Australia (phew - Perth is a long way away!). It was an excellent meeting, presenting just what we need to do with regards to making synthetic universes so we can understand what is going on in our own. As well as coinciding with the equinox, we also watched the press conference covering the latest results from the Planck Satellite. While this was a spectacular success, it also was a bit of a disappointment. You might wonder how this can be. Let me explain. The Cosmic Microwave Background (CMB) was discovered in 1964, and it was realised that this was the ever-cooling radiation left over from the Big Bang. 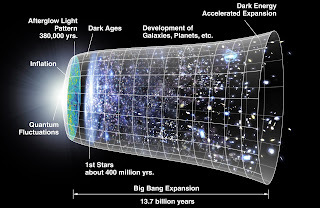 I have to show ab obligatory history of the universe to explain how it has trundled through the universe. Argh!! Another couple of weeks have flown by like a huge fast flying thing! So fast, I almost missed my birthday (which I share with another random person). And the pressure ain't off, so a quick post. This time, a great paper by Michelle Collins. As you will have guessed by now, we've been doing a lot of work on the dwarf galaxy population that orbits around our nearest large cosmological neighbour, namely the Andromeda Galaxy. We, and other groups, have been measuring lots of properties of these dwarfs, including their positions and distances. Over the last few years, we've also managed to get the spectra of many stars in the dwarfs which, for one thing, allows us to measure the velocities of stars (via the famous Doppler effect). 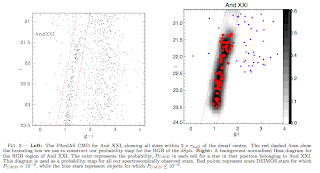 Michelle's paper focuses upon the velocities found in 18 of the 28 dwarfs we know live near Andromeda, and basically tries to find out lots of the nature of the dwarf population - such as are they all the same, or different, and how? So, a quick post today on an article I wrote for The Conversation called "Cutting through the spin on supermassive black holes". As the name suggests, I describe how astronomers can not only measure the mass of black holes, but can also calculate their spin. I must admit that the article is a little long compared to others I've written for The Conversation, and what is published is the shortened version. It's a topic that I think is pretty cool and I put in too much detail.